Celebrate New Year's Eve at the Erie Art Museum! Four bands, four beers, five hours, $30. Need we say more? The Erie Reader is proud to make the Erie Art Museum THE place to be on New Year's Eve! Join several hundred of your closest friends for "NYE at EAM" – New Year's Eve at the Erie Art Museum – from 8 p.m. until 1 a.m. on Monday, Dec. 31. Your friends at the Erie Reader have assembled a stunning collection of Erie's finest musicians in one of Erie's most magnificent and inspiring venues – the Erie Art Museum – for your listening and dancing pleasure. Performers include Zack Orr (with special guests Joey Jablonski and Pat Daugherty), Eric Brewer and Friends, Hands of Thieves (featuring Stephen Trohoske, Tony Grey, Stix Thompson, Joel Polacci, and Rickie Hopkins), and the Frank Singer and Tony Grey Jazz Duo. Your ticket to this unique and magical night includes: drink coupons good for four fine beers courtesy of our sponsor, Goose Island; light hors d'oeuvres; and a champagne toast at midnight! A cash bar (wine and liquor) will also be available. Tickets are just $30 each until Dec. 30, and can also be purchased at the door the night of the event for $35 each. Get yours at the Erie Art Museum, World of Music, Yoga Erie, and right here, right now, throught the magic of the internets. 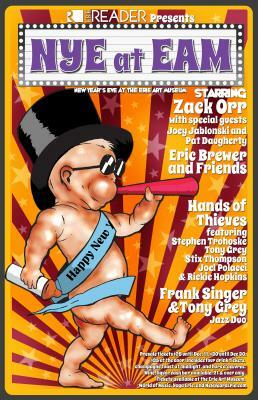 So tell your friends and family that you'll be ringing in 2013 in style with the Erie Reader at THE place to be on New Year's Eve – "NYE at EAM" – New Year's Eve at the Erie Art Museum! For all details including band bios, ticket and venue info, and directions, visit www.NewYearsErie.com.